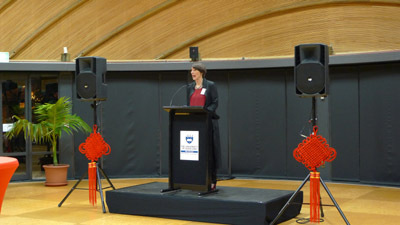 The 2015 International Award for Public Art---Cities in a Climate of Change: Public Art, Environmental and Social Ecologies jointly organized by Shandong University of Art & Design of China and Elam School of Fine Arts of the University of Auckland, has commenced at the University of Auckland on July 1, 2015. 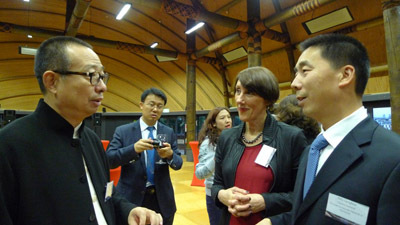 Consul General Niu Qingbao, Pan Lusheng, Chancellor of Shandong University of Arts and Design, Wang Dawei, Dean of College of Fine Arts of Shanghai University, Prof. Jenny Dixon, Vice-chancellor of University of Auckland were present along with more than 70 guests, Professors and scholars from China, New Zealand and the other dozens of countries and regions. 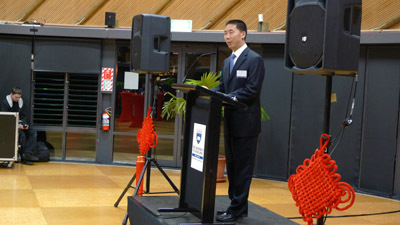 Consul General Niu expressed his warm congratulations on the opening of the 2015 International Award for Public Art and welcome to the scholars of Shanghai University and Shandong University of Art and Design who initiated and co-hosted the Award. 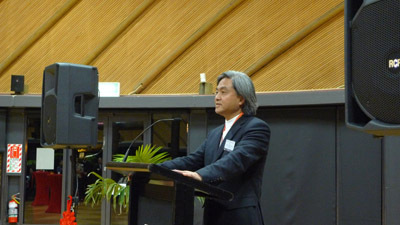 Mr. Niu pointed out that co-hosting the International Award for Public Art by the universities of both countries has been a beneficial attempt in pragmatic cooperation between China and New Zealand, which is propitious to deepening the mutual understanding and enriching the connotation of human exchange so as to promote the exchange and coopertion in the other fields of the two countries. Prof. Dixon spoke highly of the exchange and cooperation in the field of higher education between the two countries, especially the cooperative projects with Beijing University, Qinghua University and Qinghai University. She also expressed her committment to further stimulating and deepening the cooperation in the field of higher education between the two countries. "Cities in a Climate of Change" seeks to discuss art and its relationship to urban development, encouraging dialogue about public art and the place-making practices contributing to the formation of liveable cities.